Chicago, Illinois - March 18, 2008 — The Association for Retail Environments (A.R.E.) formerly NASFM, celebrated the 37th anniversary of its Design Awards presentation on Tuesday, March 18, 2008 during an awards ceremony in the McCormick Place West Ballroom in Chicago. The Design Awards presentation, held at the end of the first day of GlobalShop, presented 62 awards to 43 retail projects for the innovation and quality of their retail environment designs. REI’s new store in Boulder, Colorado received two awards -- an OUTSTANDING MERIT for design and a SPECIAL RECOGNITION for GREEN AWARENESS. This REI store achieved LEED (Leadership in Energy and Environmental Design) certification for its commitment to ecologically friendly design. 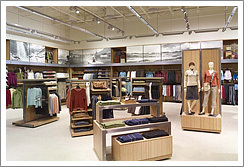 REEVE STORE EQUIPMENT CO. manufactured many of the metal components found in the store including sign holders, graphic display frames, fitting room fixtures and visual merchandising equipment. Reeve is proud to have supplied these products to the REI store and share in the success of REI’s forward thinking design. Reeve also shares REI’s commitment to the environment as shown by their recent upgrades to their facilities (see “Green is the New Black” at Reeve) and their efforts to create new ecologically friendly metal finishes. Reeve Store Equipment Co. congratulates REI on their awards and thanks REI for allowing Reeve to be a part of their excellent design. This is Reeve’s 16th Design Award in recent years (see last year's article, “Reeve Wins 14 Awards…”).